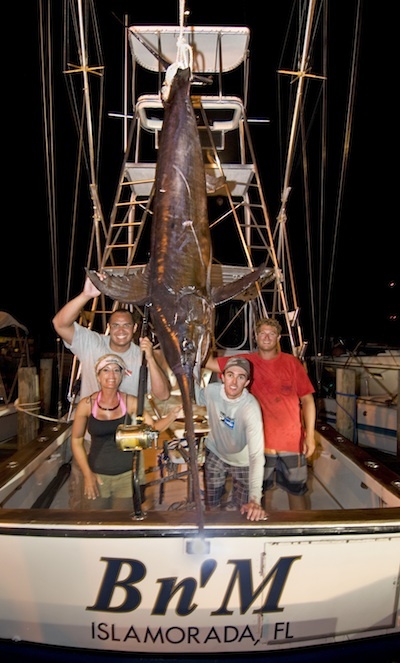 Home / Fishing / Navy Pilot Lands 455-pound Florida Swordfish! A former Navy helicopter pilot who retired from military service just three weeks ago after flying surveillance missions over Iraq for a year, reeled in a 455-pound swordfish during a weekend fishing excursion off the Florida Keys. John White, 33, of Rochester, New York, fished Saturday, September 24, with BD Pro Staffer Capt. Nick Stanczyk and mate Matt Davis on the B n’ M, based out of Bud N’ Mary’s Marina in Islamorada, Florida. After the fish hit at 1:30 p.m., it took five hours to get it to the boat. White landed the fish using a Swordfish Stick made by Key Largo Rods with a Shimano 80-wide reel spooled with 80-pound test braided line. The big fish bit a dolphin (mahimahi) belly fished nearly on the bottom in 1,600 feet of water, some 30 miles to the south of Islamorada. White said he came down to the Keys for a month’s vacation to mark the end of his nine-year military career. He said he had read and dreamed about daytime swordfishing off the Keys and wanted to give it a try. Stanczyk said they didn’t realize how big the fish was until it came close to the boat some 90 minutes into the battle. “When I saw it, I knew it was a 400- to 500-pound fish,” Stanczyk said. When the fish was finally slid through the tuna door, there was a lot of whooping and yelling onboard. “When we saw how big it was, there were lots of high-fives and everyone was really excited,” White said. To find out more about daytime swordifshing in the Florida Keys visit www.floridakeysswordfishing.com.